WeaponWatch from Radiance Technologies combines infrared sensors and high speed data analysis to detect, locate and classify a broad range of weapon firings. And WeaponWatch does it almost instantaneously, potentially allowing return fire before the enemy round or other projectile has reached your position. This remarkable technology was demonstrated at Wired's NextFest 2006 exhibition at the Javits Center in NYC. WeaponWatch is an integral part of the United States Pacific Command Overwatch Advanced Concept and Technical Demonstration (ACTD). Radiance is the prime contractor for the program. The ACTD will demonstrate a robust capability to locate a hostile threat which reduces risks and enhances mission effectiveness by providing the deployed forces with a passive reconnaissance and surveillance system. 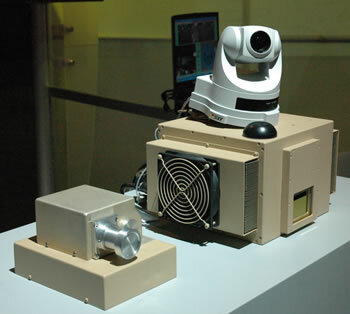 The system will be capable of surveying the target area and accurately locating active weapons within its field of view. At NextFest, I watched Radiance personnel demonstrate the system using a large portable projector capable of simulating the infrared (IR) signature of automatic weapons fire. At a distance of seventy-five feet, the camera attached to the sensor slewed to find us almost instantly. The system is also able to detect and display the exact type of weapon using its extensive database of weapon fire IR signatures, including small arms, sniper rifles, machine guns, RPGs, MANPADs, tanks, mortars and artillery. WeaponWatch detects weapons fire in light or dark across a 120 degree field of view. The system can accurately describe fire from dozens of different weapons across this wide field of view. The company's representative also described live tests in which the locations of special forces personnel were pinpointed as soon as they fired their weapons once. According to the company, there is no directive to connect this system to live-fire automated weapons systems at this time. However, the system is used to detect the location of the enemy and display it to command personnel, and it has been connected to Remote Weapon Systems using non-lethal force (i.e., rubber bullets). Connecting these components leads to accurate return fire within 2-4 seconds of the initial threat firing. It is expected that WeaponWatch technology will be used in moving ground vehicles, UAVs, helicopters, watercraft and aerostats, as well as stationary towers. Read more at the Radiance Technologies WeaponWatch page, as well as in this descriptive PDF brochure from the U.S. Army Space and Missile Defense Command . Thanks also to Blake Herrin of Radiance Technologies for the demonstration. Look at more NextFest 2006 Devices, Stories and Pictures.